Reduced face-to-face or telephone communication. However, they urge caution to avoid over-emphasising potential harms compared to the likelihood of improved outcomes. Innovate UK funded the study, which also included a focus group report of the Kemuri® Wellbeing Monitor. This is an IoT smart power socket that senses temperature, motion, and power used by kettles and microwaves in kitchens. Web software learns patterns of behaviour and checks for changes from normal behaviour every hour. The objective is to reduce NHS and Social Care costs by families identifying the risk of hypothermia, dehydration, malnutrition and unattended falls. “… there was unanimity that the device was user-friendly in terms of the user interface (screen, readability, and instructions)”. The full report, “Ethics of passive wellbeing monitoring and focus group report“, is available to download. The first indicator of declining wellbeing is the ability to cut your own toenails. That’s a conclusion of ongoing research in the Newcastle University Institute of Ageing. They identified fifteen key indicators as people’s capability reduces in the last ten years of independent living. Two scenarios are shown on the chart below. The left hand side is a typical steady decline over seven years. The right hand side is an optimally managed reduction of activities of daily living. Perceived wellbeing is higher for six years before an inevitable decline and the need for professional domiciliary or residential care services. Quarkside was surprised that maintaining the ability to walk 400 yards for six years could increase independence by almost three years. Furthermore, the period of reduced capability is shorted, resulting in lower costs for end-of-life care. This research is being embedded into the Kemuri Wellbeing Monitor software. People should consider installing a KemuriSense Smart Power Socket into the kitchens of people living alone when they cannot walk 400 yards and having difficulty with heavy housework and washing clothes. 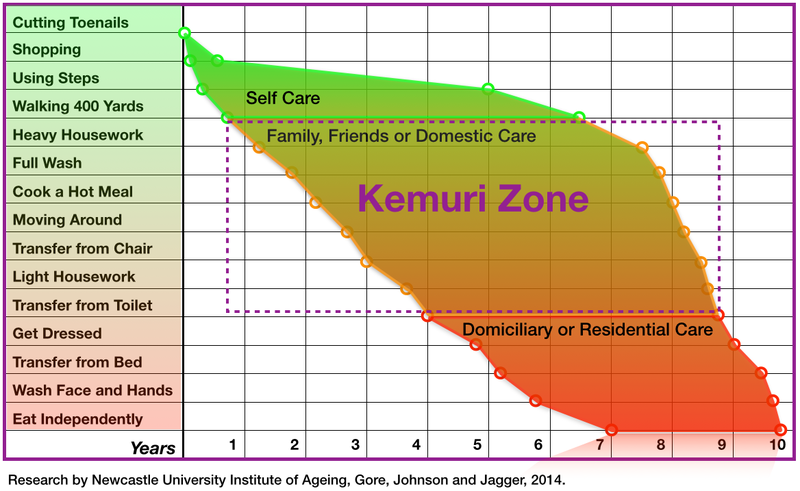 Families can expect to gain peace of mind for three to five years using the Kemuri service – when they are in the Kemuri Zone between the curves of reducing capability. The KemuriSense smart power socket was invented because it did not exist. Older people living alone are not all the same, you would not expect this with 2.5 million over the the age of 75. Some will refuse to wear telecare devices and most will not accept continuous video surveillance. One is now on show in the Digital Catapult in 101 Euston Road. It has been honoured by the presence of at least three Government Ministers: Francis Maude, Vince Cable and Ed Vaizey. Look at the Digital Catapult Showcase presentation. It gives the rationale for passive predictive monitoring for reducing the risk of hypothermia, dehydration and immobility. 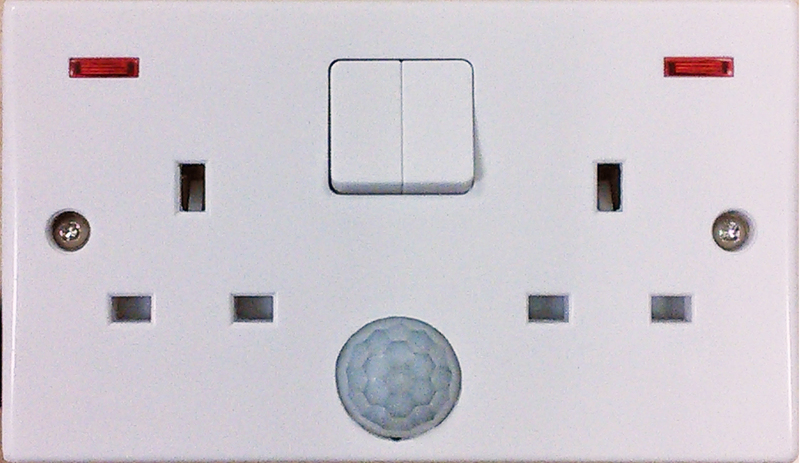 And it has a ten year vision for ubiquitous networked power sockets for offices, industry and smart homes. The Technology Strategy Board has conditionally awarded 60% funding for the Proof of Concept for the Kemuri Smart Power Socket. This is the public description. A need has been identified for a Smart Power Socket, permanently fixed to a wall that has sensors for temperature, humidity, motion and power usage. It has to send data continuously via the Internet, including during periods of power outage. No compact and tamperproof Smart Power Socket is on the market to satisfy the need. The design is unique and capable of being developed into versions for Europe and the rest of the World. The concept was awarded a prize to build the first demonstrator. This was built and successfully tested. This project takes the demonstrator through more stages of development to prepare for larger scale manufacture. This includes professional design of the enclosure, internal electronics and a set of new prototypes. It requires funds for IPR registration and certification for safety and radio frequency emissions. The use case is in the kitchens of vulnerable people living alone. They must consent to sharing data with family members or carers. The POC also includes setting up test software for data collection, predictive analytics, identity management and smartphone visualisation. The results are a prototype system that gives hourly and daily indicators of wellbeing without any active input from the older person using the kitchen. It’s good news for the millions of older people who would prefer to live alone in their own homes with non-intrusive support from their families. There’s a consultation about the regulations for protecting personally identifiable data. The government proposes allowing a number of local organisations to create secure Accredited Safe Havens (ASHs). They will have access to information from peoples’ personal care records, which could be used to identify an individual. The consultation assumes a solution that there is a need to transfer such data into an ASH. Quarkside suggest that an alternative is inherently safer. Instead of moving data to an ASH, it stays put in a Personal Data Store (PDS). A PDS resolves the problems of consent by only releasing data for analysis without personally identifiable data. This could be controlled by Mydex. People control their own health and care records in a suitably encrypted data store. Data is held in 5* format in triple stores and using URIs appropriately (ask Sir Nigel Shadbolt how to do it). Explicit consent has to be given for the extraction (or viewing) of any attribute. This avoids any data which could lead to identification being stopped at source. The consent could also be given by an Accredited Data Attorney (ADA). An ADA could be the person or any single person who has been trusted to give consent to release data for sharing purposes. If an Accredited Data Processor (ADP) wishes to use anonymised data then temporary rights are given by the ADA. Data may be given an expiry period after which any copies of the source data are destroyed. The ADP would be allowed to stored summarised data for analytical purposes. Any joins of personal data are done within the domain of the PDS and the method of performing those joins and hidden from the ADP. The risks are reduced for loss of privacy. If you go back to the principles of FAME you will see the nine principles that can make this work. The Identity Management problem is solved at source. Sharing data from multiple agencies is logically performed in an infrastructure that is like a walled garden. Each time data is released to an ADP, then the source identity would be irreversibly hashed by the ADA. The regulations would be so much simpler to implement. The ADA can release personally identifiable data to multiple agencies, such as health and social care. Again this must be time limited and the agencies would be obliged to destroy data, without any rights to store archives that contain personally identifiable data. A PDS is the repository for health and social care records. Kemuri is high value and high function with predictive analysis, pattern detection and motion. Fall detection is indirect, but better than nothing. Kemuri products and services will help towards achieving it for more families of vulnerable people living alone. Kemuri has entered a competition, “Cisco Internet of Things Innovation Grand Challenge”. The winner will receive a prize worth US$200,000. Winning would boost the ability to scale quickly to a service for thousands of families with older people living alone. A place in the semi-finals is guaranteed if the entry “Social care costs reduced with IoT sensors and predictive monitoring” is “liked” by the most number of people. To make sure that people are genuinely interested, Cisco require people to register on the Innovation web site. The publicity for being top of the poll would be useful, even if it does not lead to winning the top prize. Spreading the link would help to gather a few more votes for a worthwhile social enterprise that could have an impact on every family that is concerned about the wellbeing of vulnerable people living alone. Tunstall, is possibly the largest supplier of telecare services to UK Social Services. The newsletter of “Telehealth and Telecare Aware” tells us of rising debt and “an air of turmoil and uncertainty”. This is not good news at a time when the proportion of older people is rising. Companies in financial stress often draw in their horns and cease to innovate. The opportunities of the Internet of Things and predictive monitoring should not be missed. New technology can save or destroy businesses – just look at Kodak and Nokia. There is no reduction in demand for Telecare, we may be observing a supertanker unable to change direction quickly. Universal Credit IT is getting nowhere, expensively. At least that seems in line with the opinions of the Parliamentary Work and Pensions Committee. Perhaps the Grim Reaper should dust his (or her) spectacles and deal a death blow before the tax payers’ regrets increase. Fire, Police, Ambulance, Army and any emergency service can get a real-time movie map of a disaster area. Remember the floods of 2014. Who knew what was happening where? Were local communities upset when the emergency seemed slow to respond? This isn’t a complaint, it is an offer to help. After a National infrastructure of Kemuri sensors are installed in the homes of vulnerable people living alone, the data could be used to show a minute by minute map of power outage, humidity, temperature and movement. It would not need any public or emergency service input. A moving picture would make good TV, too. We could imagine the speed and spread of a flood as power fails, humidity rises, temperature falls and people are moving around their kitchens at 3am. As an example of how it might look, here is a video of minute by minute activity in an area the size of the Isle of Wight. A day’s data in 30 seconds http://www.youtube.com/watch?v=CDB5Nt-3h_8. It is big data in action. Kemuri plans to use this technology. The Kemuri infrastructure could provide information to a COBRA committee. The network, given sufficient resilience, could become part of the Critical National Infrastructure. The beauty is that the sensors will already deployed for a different function for families and carers; the emergency services may choose to add sensors at key locations and pay £400 per year for the privilege. All Kemuri needs is some funding to kick-start the development of production quality sensors and shared national infrastructure. Kemuri entered a hackathon “to develop prototypes that can support communities to be resilient to and adapt to environmental crises and change.” with £5000 first prize. The event was cancelled; apparently there weren’t enough competitors. Are we that short of innovators in the UK? Quarkside postings by email. Governance matters.